Residence la Pieve was built in the 50's. It was originally an artisan's workshop, where linen was produced. Looms were lodged in the top part of the building, embroidery was carried out in the lower part. 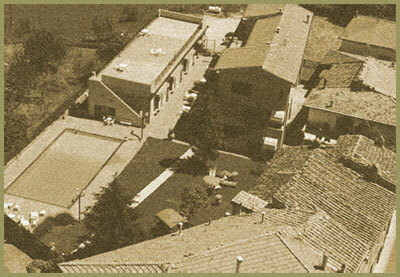 In the 70's the workshop moved to the industrial area of S.Donato in Poggio: hence the building remained empty. In the 80's the building was bought by its current owners who managed to convert the complex into its present state, a perfect place for a a relaxing holiday amidst the rolling Chianti hills. It was one of the first of its kind to exist in the Chianti region. Residence la Pieve is situated in a beautiful place, 20minutes from Florence, 30 min from Siena, 25 from San Gimignano. It's very easy to reach the most important cities of art, and it is a perfect spot for a relaxing holiday, there are plenty of delightful country walks to go on in the area.